Ken shows Baytown Bert his artwork at Starbucks on Garth Road July 2008 / Ken paints a young couple sitting on the banks of Goose Creek, circa 1930's. See Ken's Portrait of a Warrior Memorial Art Gallery here! Ken's FB page is here. 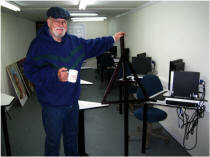 Ken has moved from Baytown and everything new about the gallery is on his web site and his Facebook page. I met Ken "the Dauber" Pridgeon this year at the Baytown Fine Rides car show on Texas Avenue. He was seated comfortably on a folding chair, artist's pad on his lap, doing what he does – sketching in preparation to paint. He's a friendly, approachable artist, humble man, avid teacher and a local treasure, to be sure. Recently Ken and I met at Starbucks on Garth road to discuss his painting depicting Iraqi Freedom Purple Heart Recipient, Sgt. Nick Marshall and "Dauber" in his usual entertaining and charming way began to expand on this particular painting's" story. Ken is a passionate veteran artist and his visions come to life in his paintings. This is his two-part story in his own words and his emotion-laden telling brought tears to our eyes. I got out of the Air Force in 1963 and did not know how to talk civilian. I must skip some things and go straight to what I had dreamed of doing, from when I did my first sketch – become a billboard artist (be careful what you wish for!). My first day painting, (wow, what a day!) they put me on a ball hanging from a crane, with a 25-pound hook on each shoulder and hoisted me up 75 feet to the top of a billboard over on I-45. Let me explain, normally, instead of hooking onto the painter, they put the hooks 20 feet apart on each side of the boardwalk and hung what was known as "Falls" onto them, so we could pull the "Stage" which was another word for the walk-board that painters pulled up to stand on, while they laid out the sign. We painted automobiles, cigarettes packs, whiskey bottles, Marlboro cowboys and waterfalls for Kool cigarettes. We also did all the Old Grandad whiskey ads. Every year we painted the new automobile billboards and nobody even knew we were there or cared and we painters got zero recognition for laying our lives on the line every day. We were invisible in our trade and the hazards were many. We painted one billboard each day for about $7 an hour. It was dangerous work and we lost many good artists in the time I was painting billboards due to fatal and crippling falling accidents and it was quietly talked about in hush tones by us painters and then hidden away in the backs of our minds. 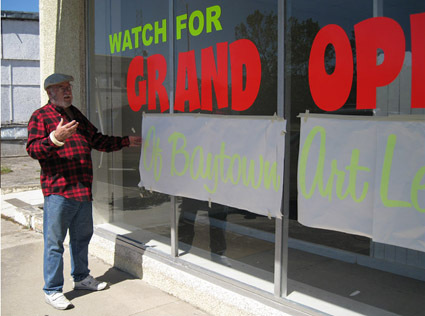 Ken "the Dauber" Pridgeon puts the finishing touches on the new Baytown Art League building's front window. If people are interested in why I paint so rough I guess it is because we painted up 65-feet above the ground using rags for brushes. Grabbing a rag from the box we'd just daub onto the red, black and yellow paint for the wood grain backgrounds. We would mix up a good background color on the rag and go horizontally across the board wiggling as we went for the wood grain, then daub into the black and red for the knotholes. You get the idea. For the Kool cigarette waterfall we would do almost the same thing except use the blue, white, and tallow to make the pretty water bubbles and pat-pat-pat for the foam at the bottom. By the way, we were good artists! When it was raining, we would paint the signs inside with brushes because "the bid boys" (sponsors) were watching. We painted some fine portraits of the Mist Scotch girls and the KIKK disk jockeys and people running for mayor and other political offices. Well, I did this for a few years and even bought a family plot at the cemetery so my folks would have a place to put me. There were so many ways for a person to lose their life doing this kind of work and I didn't want to be a financial burden if I fell. The biggest problem with working up high like that is even if a bomb goes off under you, you have to stay focused on what you are doing or you will over react and if you do - you are a goner. Speaking of distractions, the day I finally quit painting billboards, I was working my way around a monster-sized billboard staying real close to it, as it is a very narrow walk board up there. I startled a pigeon nesting under the board. He flew up through my jacket and out under my chin with lots of flapping, flopping, and scratching. I looked down 65 foot to the railroad tracks below and of course it could have been a feather bed and I would not have survived the fall. To make a long story shorter, I climbed down thanking the Lord for every step and went home never to return to the dangers of being a billboard artist". Ken shows his story of Iraqi Freedom bravery and the wounding of Sgt. Nick Marshall of Baytown, Texas and finally meets Nick October 2008. Last week I told you a little about Ken "the Dauber" Pridgeon and how he exited the Air Force and began painting billboards to make ends meet. 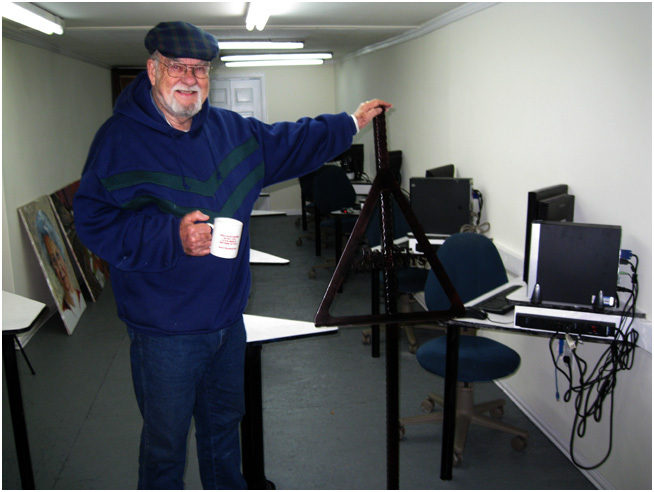 This week, I once again sat down with Ken at his studio – KTD Signs on Morrell Street and we dug a little deeper into his passion, which is, of course – painting and painting he does well. He had just put the finishing touches (dauber-style) on his story of struggle and armed conflict, covering the wounding of Sgt. Nick Marshall in the war torn hell of Iraq and we discussed the future of art in Baytown. This finishes up a two-part story on Ken, but hopefully the best part of his story is yet to be told. "Many good artists lost their lives on those billboards and this story is just one of many and probably won't help anyone remember the loss. Anyway, I was fortunate to end up with my own sign business and in fact, quite a few businesses altogether. You see I am a good designer, but not a good businessman. (Ken laughs) Somehow I've stayed in business over thirty years, starting with lettering on barges for Hollywood Marine. Here I was, more artist, than athlete, in another hazardous job! Each day, I would ride a tug out into the Gulf. They would hang me over the side and I would commence to letter those barges, waves lapping up around me. It was good money and I kind of felt like my own boss, but one day I lettered a barge and the thing blew up the next day, letting me know that this was as dangerous as billboard painting. That helped me make up my mind to try something else. So here I go lettering helicopter pads on offshore oil platforms for my next adventure. The crew loved the fact that I could custom letter logos and all kinds of things. One day I was painting a landing pad with a heavy brush – daubing, as the material was thick and had sand in it to keep the helicopters from sliding off into the Gulf. Mr. Powell of Powell Industries watched me working and asked why I painted like that and I explained the only way to make the paint stick was to daub it on. He laughed and told me from this day forward, he was christening me "Ken the Dauber" and well, the name stuck. Forty years have passed and I made some good and some bad business decisions, but I've continued to learn and paint and these days I'm solid as steel in my desire to teach budding artists and continue my own education. I just want to be a fine arts painter and have folks stop and stare at my art and the stories each one tells. I am so truly blessed to get up each day and paint. Someone mentioned that I may get rich from my paintings and I just looked them in the eye and said - I already am. Each day I can paint makes my life richer. Enter the Baytown Art League and Baytown's rich history. City Council has purchased a wonderful building at 110 Texas Avenue for us to have an Art Gallery and School and now it is up to us to justify their faith in us as artists, photographers and anyone who loves art. I am just a paint dauber, but as I've said, it's my dream to grow into a fine arts painter. One time I heard that there are over a thousand styles of painting and I think I know about 300 of them and I want to learn more. I want to share knowledge and we seasoned artists want to paint our knowledge onto the canvas' of young artists minds. 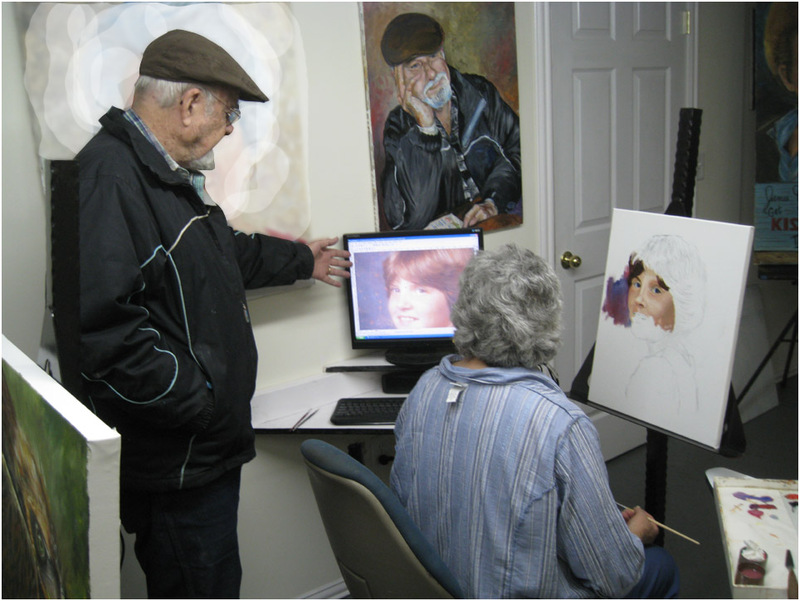 That is what the Art League is all about – sharing. Artists, painters and photographers sharing technique, ideas, experience and the simply joy of our individual artistic endeavors. With our new building at 110 Texas Avenue we have room to grow. All we need are budding artists. Membership is very reasonably priced and yes, we will gladly accept any and all help we can get to make our new building represent the future generations of artists. We need folks to join and we need a little help from those who are supportive. In fact, a membership would make a wonderful gift for someone you love. I'm just a dauber, but I want to thank our city council for making this dream come true. I was at one of the town meetings and I'm sure it wasn't easy bringing everyone into agreement on this project, but I know why they did it – to preserve our history through developing the artistic abilities of our budding artists, young and old(er). Our developing artists will record tomorrow's memories, but first we must make a platform for them to grow. It's my personal dream to paint a large multi-pane mural of the history of Baytown and I am asking to copy any and all old photos that showed the Tri-City area of Pelly, Goose Creek, New Town, Wooster, Baytown and Cedar Bayou, to name a few. I can be reached by phone at 832-514-1452. Come on by for a visit". 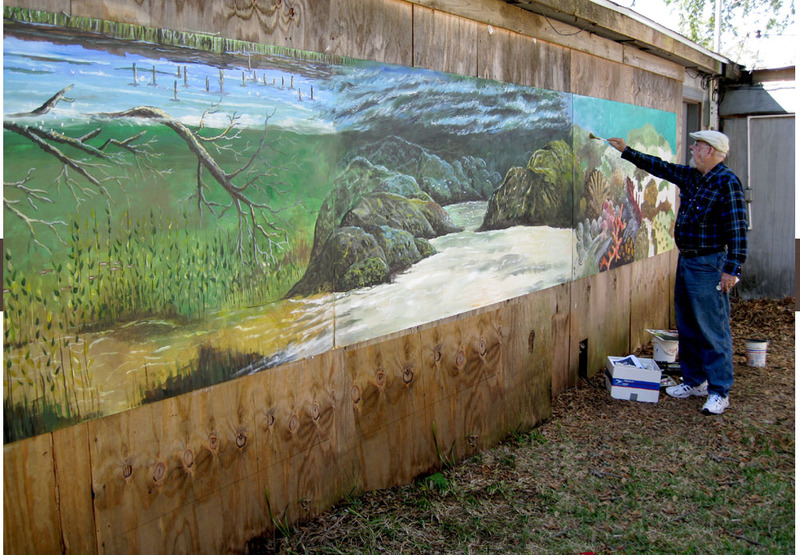 Ken "the Dauber" Pridgeon puts the finishing touches on the new mural for the Eddie V. Gray Wetlands Center. Ken Pridgeon, better known as "Ken the Dauber," has a vision. He sees the pond near his Lee Drive home filled with children and their fathers paddling in boats and fishing. He appreciates the beauty in fish and nature, and wants kids to appreciate them as well. "A kid with a fishing pole is a kid without a gun," the artist said. Well, the Eddie V. Gray Wetlands Center is helping Pridgeon take steps toward his vision of educating children. The 72-year-old artist has donated several of his original paintings to the nature center. Tracey Prothro, natural resource programs superintendent, said that the Wetlands Center's fishing camps and nature programs drew Pridgeon to the facility. "We do a lot of education of kids, and that spoke to him," she said. "I think they're perfect for here." The five pieces, hanging in a conference room of the main building, depict vibrantly colored fish, luscious skies and fluid waters. "I like to make my fish bigger than the people," he said. "It's a little crazy, but I want you to focus on the fish. The people are not that important." One of the paintings captures Pridgeon's 7-year-old self, fishing in a small pond behind his house. Each nook and cranny of his piece has a different story to tell, from his mother's sewing spool, father's old reel and broken rod. "This is me in my mind as a kid," he said. "It's my first fly rod. I didn't even know what a fly rod was." The Baytonians work can be seen all over town, for he designed several auto shop signs along North Main Street. He earned his nickname, "Ken the Dauber," about 30 years ago when he painted helicopter-landing pads. He said that because the ground was so hard on his paintbrush, he had to daub the paint along the road. "[An official] said, I dub you 'Ken the Dauber,'" he said. "A dabber is not very classy, but a dauber, that has a little flare to it." His friends and family members been become used to calling him by his nickname, so much so that they forget his real last name. "I've been Dauber so long that people write checks to me as Ken Dauber," he said, smiling. Pridgeon is currently working on the last of three panels for the center's snake exhibit. "Chiquita [the snake] is bright yellow, and will look beautiful in there," Prothro said. Pridgeon is a jack-of-all-trades, dabbling in poetry writing, singing and inventing. But his canvases and paintbrushes hold his passion. "[Fish] are beautiful," he said. "I want them to see the beauty in everything, not just in fish, but see the silver lining in everything." Ken “The Dauber” Pridgeon is working on several projects, one of which is a mural for the Old River Winfree Founders Day. He isn’t quite done with it yet, but he knows exactly what he expects the finished product to look like. Founders Day is held each year on the third weekend in July, and is meant to celebrate the history of the community, which is pretty fitting because Pridgeon himself has a passion to preserve the area’s history. That can be seen in his painting of Texas Avenue in Baytown from in the 1930’s. Pridgeon started painting casually as a kid, but didn’t go in depth with it until he was in the Air Force. “I knew I wanted to paint when I was young,” he said. “When I was I a kid, I used to paint ducks, and deer, and other wildlife, and I enjoyed it. Then I later joined the service, and at any big event, I was always making posters, and I later started painting pretty girls on billboards, or whiskey bottles or beer, that kind of thing. I painted a lot of automobiles on billboards. We did a new one every year. It wasn’t until his 72nd birthday that Ken "The Dauber" Pridgeon decided to pursue his passion for painting when his son, Shawn, asked him to paint a portrait for a friend’s funeral. Shawn died one year ago but his encouragement spurred "The Dauber’s" talent and led to several commissioned paintings throughout the city, hundreds of portraits and the opening of the Dauber School of Fine Art. The school at 216 Morrel Avenue opened Monday and has 15 students enrolled. Classes are 3-hour sessions Mondays and Thursdays at 10 a.m. and 2 p.m., Tuesdays at 10 a.m. and 6 p.m. and Saturdays at 10 a.m. He dedicated the school to the memory of son Shawn Edward Pridgeon. "He wouldn’t take no for an answer," Pridgeon said. "There is no way I would try to teach without his encouragement." Eighty-eight people joined "The Dauber" at the school’s grand opening celebration Jan.16. The crowed huddled inside of Pridgeon’s home and were entertained by an art demonstration by the artist and complimentary barbecue. "It was a good time," Pridgeon said. "I’m glad there was enough barbecue and people showed up in the weather. Students will learn to paint by using the "Dauber System." The method uses Corel Draw 12, a graphics program, to impose images onto landscapes or scan images, which are then projected onto a canvas for the artist to paint. Pridgeon walked a long hard road. to became "The Dauber." While he was in the Air Force, Pridgeon was known for his drawing talents and was often asked to draw for fellow airmen. In 1956, while stationed in Florida, he took Norman Rockwell’s famous artist class. During the class, Rockwell showed how he used a projector to paint the majority of his work. A fan of Rockwell’s, Pridgeon was disappointed in the artist’s painting method. "I was so mad," he said. "It took me a week to get one." After the military, Pridgeon tried to find work as an illustrator for the Houston Post and The Chronicle. "They say they couldn’t use me do to lack of experience," he said. "I told them I was trying to gain some." Unable to find work drawing for newspapers, he set his sights a little higher, 65 feet to be exact. Pridgeon went to work for Eller advertisement as a billboard painter. Every day he would strap ropes through "falls," hooks on both shoulders, and battle yellow jackets and pigeons for equal space. "We had to let the yellow jackets sting us," he said. " It’s not like we could run away." The final straw for Pridgeon was when a pigeon flew into his jacket on the job. "He flew head first into my coat, probably just wanted to borrow my jacket," he said. "That was the last day I clocked into that job." After a career in sign painting, he went into business for himself painting the sides of barges and helicopter pads. "Painting barges was good money," "The Dauber said. "I was the only one dumb enough to do it." But it was the blotting technique he used to paint helicopter pads that earned him his nickname. "I was knelt down painting when a woman was trying to figurer out what I was doing," he said. "I’ve been ‘The Dauber’ ever since." Now his artwork can be seen at Roosters Steak House, the Baytown Historical Society, City Hall and the Eddie V. Gray Wetlands Center. 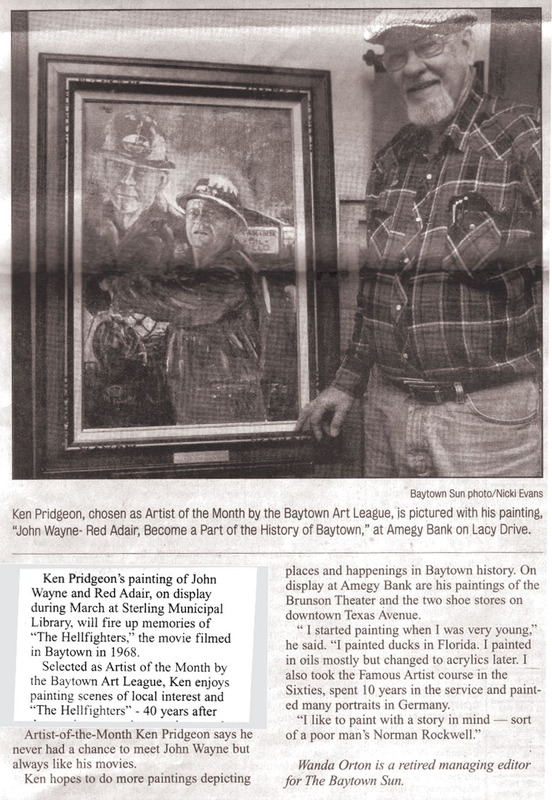 Two years ago, he was asked to teach a portrait class and become a member at the Baytown Art League. It did not take the artist long to find he could also be passionate about helping others find their creative outlet. Along with friends Alan Theis and Mike Meyer, he built The Dauber School of Fine Art in only three weeks. The school is equipped with five workstations with computers and was not built with grants or loans. " We couldn’t afford contractors," "The Dauber" said. "It was done with hard work money from my own pocket." He said the road he has traveled was not his intended path but he’s excited about his adventure in art education and being a constant student of his craft. "All I was trying to do was be a portrait artist," "The Dauber said. "It’s amazing what you can do in 75 years."